It’s impossible to escape the slums in India. The Bessemer office in Nariman Point overlooks slums. The apartment I’m staying at in Worli overlooks slums. Even Mukesh Ambani’s mansion overlooks slums. But that’s a microcosm of the real India. The significant majority – in fact, the overwhelming majority – are not much better off. Here’s a graph of the evolving demographics of India compiled from a number of data sets. “Poor” means a family earning less than 1 lakh rupees a year (a little over $2000). 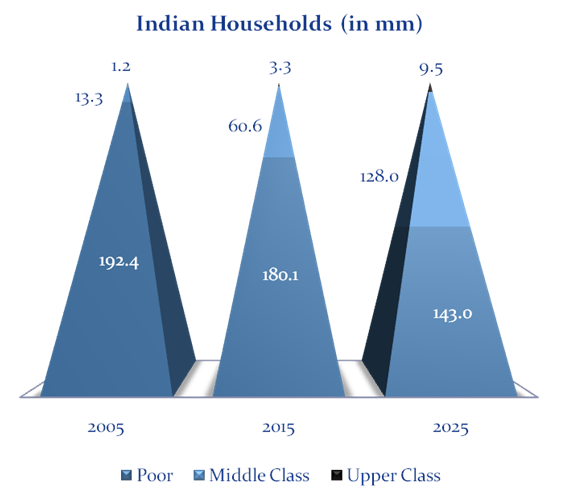 “Middle Class” means a family earning between 1 lakh rupees and 10 lakh rupees a year (between $2000 and $20000). Upper class is above 10 lakh rupees a year, or $20000+. While the positive trend is the number of people going from “poor” to “middle class” by 2025, the sheer magnitude of people in the “poor” class is staggering, saddening, and maddening. That’s the real India. And as investors, I hope we remember to not only strive to do well for ourselves, but to do good with our capital for the real India and the real world.